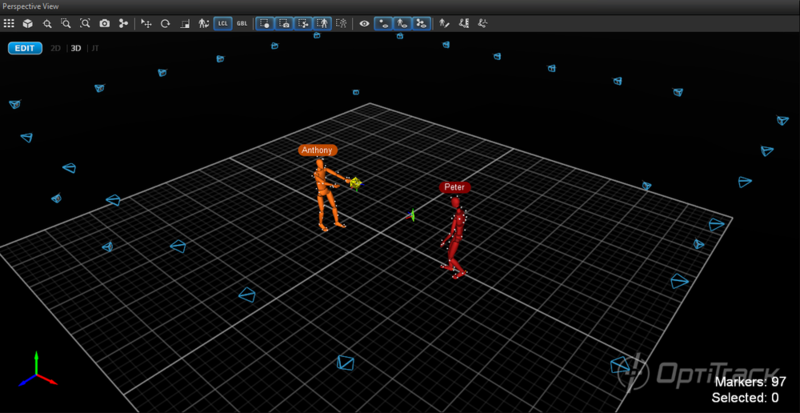 Follows selected marker, skeleton, or rigid body in the perspective view during both capture and playback. Move 3D Object. * The Edit Skeleton must be enabled to use this tool. This tool allows users to click on a skeleton bone segment and apply translation along its x,y,z of the segment axis or the global axis. This is featured only in post-processing of a recorded 3D data. When the change is made, the segment hierarchy will be modified and reflected on exported skeleton bone data but the marker locations will remain the same. Rotate 3D Object. * The Edit Skeleton must be enabled to use this tool. This tool allows users to click on a skeleton segment and apply rotations about x,y,z of the segment axis. This is featured only in post-processing of a recorded 3D data. When the change is made, the segment hierarchy will be modified and reflected on exported skeleton bone data but the marker locations will remain the same. Scale 3D Object. * The Edit Skeleton must be enabled to use this tool. This tool allows users to click on a skeleton segment and re-scale its length. This is featured only in post-processing of a recorded 3D data. When the change is made, the segment hierarchy will be modified and reflected on exported skeleton bone data but the marker locations will remain the same. Local Axis. * When applying translation, rotation, or scaling onto a skeleton segment, the changes will be applied in respect to the local coordinate axis. This option is mutually exclusive with Global Axis. Global Axis. * When applying translation, rotation, or scaling onto a skeleton segment, the changes will be applied in respect to the global coordinate axis. This option is mutually exclusive with Local Axis. Enable Skeleton Assigned Marker Selection. 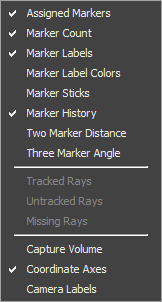 * When this feature is enabled, you can select on expected marker positions (transparent) of a skeleton. This can be used to remove assigned markers from a skeleton definition. For more information: Skeleton Tracking page. Missing Rays: Show/Hide Missing Rays from the view. Missing Rays are the expected marker centroid rays (available only in 2D data), based on reconstructed 3D points, that is missing from the 2D camera view. Symmetrical bone length* When this feature is enabled, any modifications on bone lengths are applied symmetrically on both left and right side of a skeleton. Symmetrical bone orientation* When this feature is enabled, any modifications on bone orientations are applied symmetrically on both left and right side of a skeleton. Zooms all cameras to fit the pane. Zooms into selected cameras to fit the pane. Zooms all cameras to either 50%, 100%, or 200% real size (in pixels). Activates a tool to draw circular masks on the cameras. 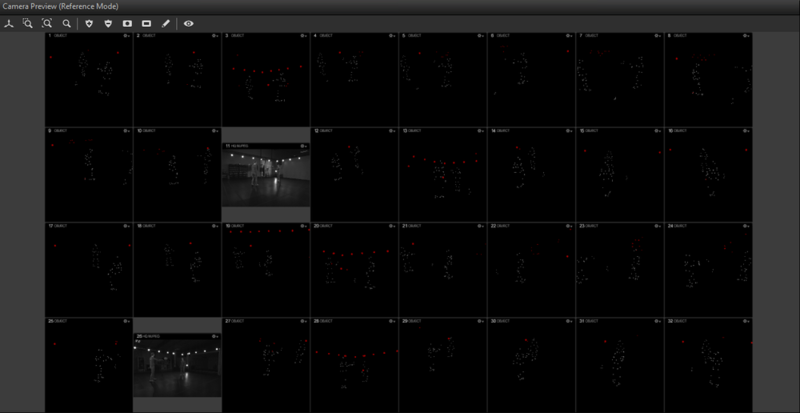 Activates a tool to draw rectangular masks on the cameras. Activates a tool to do manual drawing of masks on the cameras. 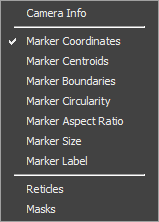 Marker Boundaries: Show/Hide square intrusion boundaries for the detected markers. Multiple reflections sharing, or intruding, the boundary is considered as one object. Marker Aspect Ratio: Show/Hide aspect ratio of the intrusion boundaries. The label will appear red if the reflection does not satisfy the 2D filter setting. This page was last modified on 3 November 2016, at 12:57.